United States Says No To 2020 Olympic Bid : The Two-Way An Olympic committee spokesman said the U.S. was focused on other things, including negotiating a new revenue-sharing arrangement with the International Olympic Committee. 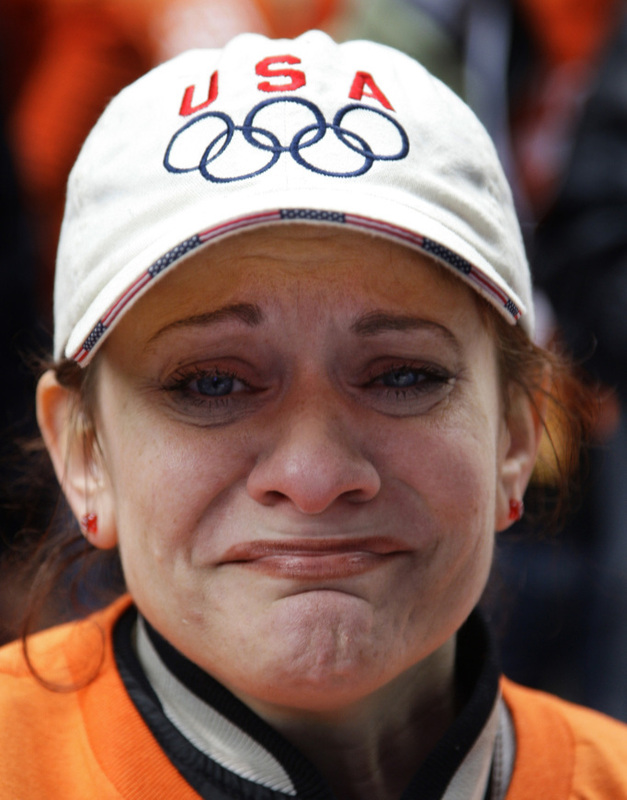 This Oct. 2, 2009, file photo shows Chicago 2016 supporter Patti Nugent reacting after the announcement that Chicago was eliminated as a possible host city for the 2016 Summer Olympic Games. American fans of the Olympics will have to travel abroad for at least another decade if they want to cheer from the stands at one of the world's biggest sporting events. The U.S. Olympic Committee (USOC) announced today that there will be no American bid to host the 2020 Summer Olympics. Actually, the news was Tweeted by USOC spokesman Patrick Sandusky. "I can confirm the US will not be bidding for 2020 Olympic Games," Sandusky wrote to his Twitter followers. Sandusky tells NPR, "Our focus is on other things," including preparations for next year's summer games in London and ongoing negotiations for a new revenue-sharing arrangement with the International Olympic Committee (IOC). "That precluded us from being focused on any sort of bidding process," Sandusky adds. The 2020 bidding begins on September 1, when the International Olympic Committee (IOC) accepts nominations from national Olympic committees. In the past, the USOC staged extensive domestic bidding competitions before selecting American candidates. No such process was launched in advance of next week's IOC deadline. Olympic boosters in Tulsa, Dallas, Las Vegas and Minneapolis expressed interest in a 2020 bid. There was also lingering interest in Chicago and New York, which failed to win bids for the 2012 (New York) and 2016 (Chicago) games. U.S. Olympic bidding has stalled, in part, because of an ongoing revenue-sharing dispute with the IOC. American corporate sponsors and television networks generate the biggest share of Olympic income and the USOC traditionally takes the biggest cut — 12.75 percent of the TV money and 20 percent of sponsorship revenue. But other national Olympic committees resent the arrangement, especially as some struggle to train athletes and get them to the Olympics. "We believe it's important to complete the revenue-sharing agreements with the IOC before moving forward in the bidding process," Sandusky tells NPR. That also applies to an American bid for the 2022 Winter Olympics. "Until that deal is done we would not be in a position to potentially bid," Sandusky says. Groups in Denver and Reno-Lake Tahoe have expressed interest in 2022 bids. Neither the USOC nor USOC will discuss the revenue-sharing negotiations. Sandusky will only say talks are ongoing. The last American city to host a Summer Olympics was Atlanta in 1996. In 2002, Salt Lake City hosted the winter games. At least four international cities have committed to bids for 2020: Rome; Tokyo; Madrid; and Istanbul. Olympic officials in South Africa announced last week they would not nominate a host city. Officials in Dohar, Qatar, have indicated they may still submit a bid.